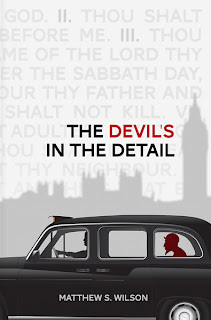 The The Devil's In The Detail Giveaway is now closed, and I enjoyed reading about your favourite books and movies with the word 'devil' or 'angel' in the title. By far the most popular entry was Angels and Demons by Dan Brown. I received entries from the interview post with author Matthew S. Wilson, the book review and giveaway announcement and at GoodReads where the giveaway was also being advertised and was very popular. Dale's entry was The Devil's Advocate by Morris West. Dale, please email me with your postal address, and I'll send your signed copy of The Devil's In The Detail by Matthew S. Wilson. Thanks to all who entered this giveaway. For those who missed out, you can read a FREE extract here. You are more than welcome Dale. Congratulations on your win, and I hope you enjoy the book.